Photo courtesy of Elizabeth Martin. Everyone dreams of having the perfect physique with a flat stomach or maybe even six-pack abs. Equestrians want to look good when sitting tall in the saddle with form-fitting show clothing that highlights the perfect posture you’ve worked so hard to attain. 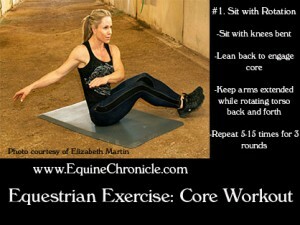 A strong core equals a strong body, but you can’t just concentrate on one body part. 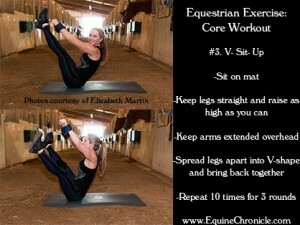 To go along with your lower body (http://www.equinechronicle.com/healthy-horse-show-living-lower-body-workout/) and upper body (http://www.equinechronicle.com/equestrian-exercises-upper-body-workout/) workouts, Monica Brant, 1998 IFBB Fitness Olympia and 2010/2013 WBFF World’s Pro Figure Champion, has created a challenging core workout. 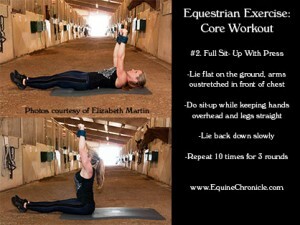 For your core workout, you will need a workout mat and wrist weights, which can be found at any sporting goods store. Sit with your knees bent. Then, lean back slightly. With your arms extended, rotate your torso to the left and your feet to the right, back and forth. Your toes can tap the ground on each side before moving back. 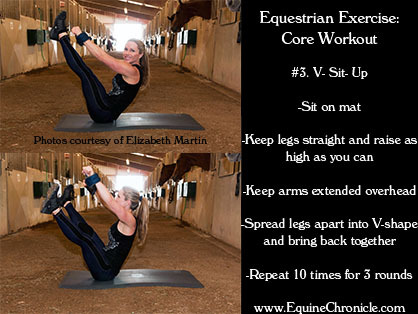 To make it harder, you can incorporate holding a medicine ball between your knees, or anything in the barn you can find, that can give you extra weight to move back and forth while your knees are tightly squeezed and you’re balanced on your buttocks. Repeat five to 15 times each side, for three rounds. Start by lying flat on the ground with your arms stretched out in front of your chest and legs straight out in front of you. Perform a sit-up while keeping your hands over your head and your legs straight. Your chest should come all the way up and reach for the sky. Slowly lie back down. Repeat 10 times, for three rounds. If the full sit-up with press was too easy, try the V-Sit-Up. Start by sitting on the mat. Then, while keeping your legs straight, raise them as high as you can. With your arms extended over your head, hold this position. Spread your legs apart into a V-shape and then bring them back together. Repeat 10 times, for three rounds. 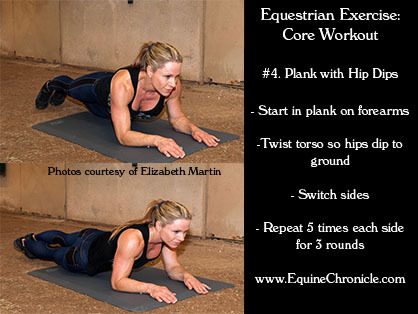 The plank is one of the best exercises you can do for a total body workout. To add some difficulty to this basic exercise, start in the plank position on the forearms. Twist your torso so your hip dips to the ground. Start to the left first and then go to the right. Repeat five times each side, for three rounds. 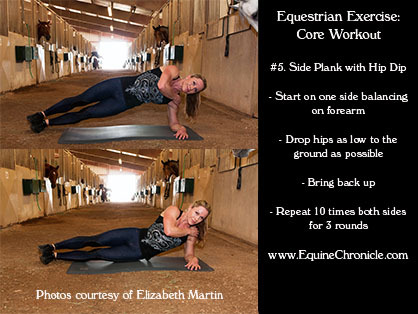 Another version of the plank is the side plank, where you start on one side by balancing on your forearms. If this position makes it hard to stay balanced, you can place one foot in front of the other until your balance improves. You can also work your obliques and hips more with hip dips; drop your hip as low to the ground as possible then bring back up. Repeat 10 times both sides, for three rounds. Repeat these five exercises three times each for a fluid workout. Remember to keep hydrated while working out. If you have questions for our fitness guru, please send an email to b.bevis@equinechronicle.com.